It’s over. This series is over. I’m happy and sad. I don’t remember how long it has been since I finished a series. Nowadays series are 100 books long so I haven’t had to worry about saying goodbye to some of my favorite series. It’s always sad to part with characters that you feel are real and that you have loved for years. In the other hand I feel this feeling of accomplishment. I finished a series! Not any series, but a series that I absolutely adore. To tell you the true I think this book was my favorite in the series. I love the dark feel of the Mazikin city. There was not a dull moment in this book and I loved that. I also enjoyed the way the problems were solved. The conflicts and missions Lela had to solve didn’t pile up until the end like it usually does in books. I feel like that helped the book’s pace. I wasn’t worried about situation A while situation F was happening because it was already over and done with. 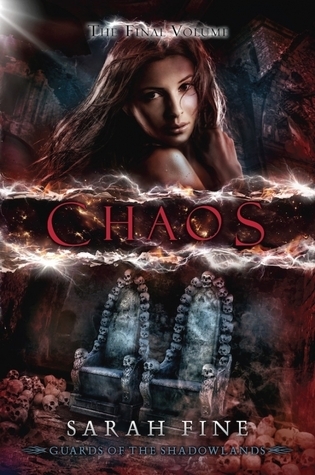 We get a lot of romance in Chaos but it doesn’t overpower the plot. But I truly enjoyed the little kisses here and there because Lela and Malchi deserve that, and much more. I don’t want to forget to mention the awesome new characters that get introduce in this instalment!! Oh, and the bad, evil ones too! I actually didn’t trust anyone that I didn’t know, until the end. There was too much at stake to get comfortable and Lela wasn’t trustful of anyone either, which I approved of! If you haven’t read this series you definitely need to. It’s such an easy, awesome and action full series that I feel that anybody would enjoy it. I hear ya about the never-ending installments in a series which is why I've been reading more and more trilogies lately. Good on Fine for ending this story with a bang! I haven't started these yet, but they've come highly recommended from all of my blogger peeps, and your 5-star review is further proof of that. On it! Yes! I am doing a happy dance because I think this might have been my favorite as well. Sarah is an amazing author and I love that so many people are loving this series as well. It is sad to see it end but thankfully she has a ton more in the works for us with new and exciting characters and series.